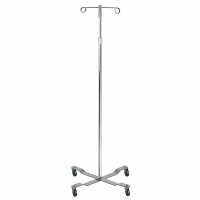 Mayo Instrument Stand with Mobile 5" Caster Base . 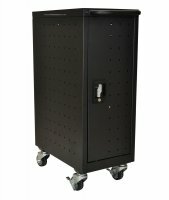 Five casters on the base provide sturdy footing and additional mobility and convenience for this Mayo Instrument stand by Drive Medical. 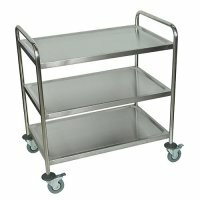 The product includes a removable stainless steel tray that measures a roomy 19" x 12 1/2". The tray height adjusts from 29 1/2" to 47" and is secured in place by a lock. The stand is also protected by a limited lifetime warranty. 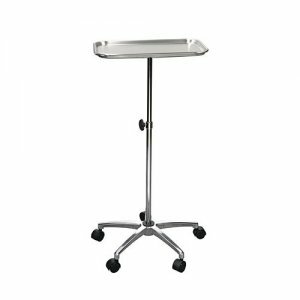 Table/Tray (Width): 19"; Table/Tray (Depth): 12.5"; Height: 29.5"-47"; Base (Width): 21"; Base (Depth): 21"; Product Weight: 11 lbs.